Pinch me! Did I just feel SUNSHINE on my skin?! Finally for REAL?! YES!!!! Well, we made it through a very grueling and seemingly interminable winter. The bees endured not just shockingly frigid below-zero stretches, but a subsequent marathon of overcast, wet days and icy nights. If your hive survived until now, you should be doing the happy-pants dance. Do they HAVE a queen? Look at the brood pattern. Is she laying strong, not shot-gun? Are drones interlaced in the worker brood (shooting blanks)? If so, now is the time to re-queen. Also, re-queening greatly aids in preventing swarming. This is doubly true if your hive is already busting down the doors. Another way to help prevent swarming is to do a split to relieve the congestion that can trigger swarming initiation. Remember: a swarm may depart at the capping of a queen cell, not just when she hatches. Spring and late summer are the two most important windows for mite control if you do treat. Everyone has their own choice on what to use. However you address mite management, do that. Have a plan, have means to take a mite count and be determined to know your mite loads during the entire summer. This knowledge will help prevent you and your bees from getting broadsided unexpectedly by population decline, viral infections or crashes later on. Not sure how to do this? Call a beekeeper friend, (or you may contact me, and I will help you) or brush up reading on how to do a varroa mite count. This COBKA site also has links for such. Remove old, black comb from older hives before they fill up with honey or brood. Replace with cleaner drawn comb, or fresh foundation. Brown comb is not a bad thing. But once it gets really dark, almost black, it's time to replace it. As the comb darkens due to pupae cocoon layering, the cells get smaller and smaller, and so will the bees. Also, wax retains an accumulation of chemicals the bees get exposed to, so frame rotation is something to keep in mind. Healthy bees swarm. If you overwintered, have last year’s queen, and your bees are ramping up in population, expect them to swarm. 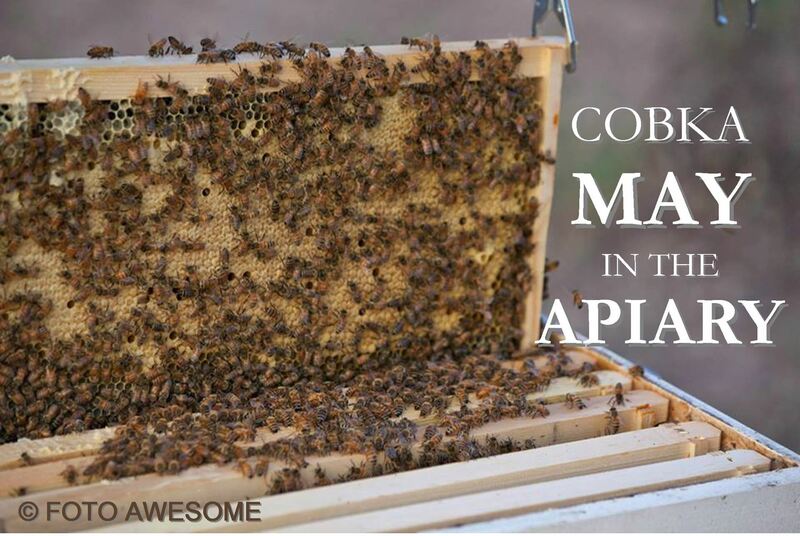 Every 7 days lift up your top box, (I smoke during this process to expose all of the comb's nooks and crannies to expose swarm cells) and thoroughly check for swarm cells. I love bees, but when it comes to swarming, these cute little girls can be quite the creative, conniving and sneaky little devils. SO: have a 2nd hive ready to either split your hive if needed, or to house a swarm if you catch one. May is the month of lots of bee fun ( i.e. -chasing your bees through the neighborhood, opening up the hive and seeing 20 swarm cells capped and ready to go, bee stings morphing your face because you got too excited to suit up properly...oh, just lots of cool things...). If you are wanting bees to draw out comb, feed 1:1 sugar water. If you have all pulled out frames, you may still feed if you see the girls could use it. Often though you will find that they prefer natural forage when there is a flow on. Always feed nucs, packages and splits. Reduce entrances on these as they are just getting established.